One of my favorite blogs, Howdy from New York City, posts her "random thoughts" every week. I love when she does this, and today, since I have a lot of thoughts in my head, I decided to do it too. Monday is my favorite Holiday....HALLOWEEN! I live for Halloween and start planning my costume months in advance. 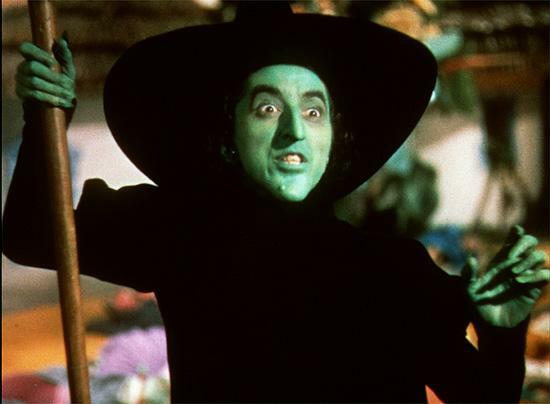 This year I will be dressing up as the Wicked Witch of the West...however, I plan to be much UGLIER! On Saturday, I am helping host a huge Halloween Bash with some other friends here in DC, and that is when I will actually don my witch costume. There will be tons of fake blood, cobwebs, cauldrons, and fun...I will give a full report Monday. I am a loyal Good Morning America watcher. This morning one of the top stories was about the new "Tattoo Barbie". Apparently, a lot of mothers blogs and parenting groups are outraged that Mattel has created a Barbie that is such a "bad role model". In my opinion this is such a non-issue. If you do not like the doll and do not want your children playing with it then DO NOT BUY IT! It is that simple. Stop micro-parenting for the rest of us...stay out of my life and I will stay out of yours. Done and done. I think she is pretty! The Tattoo Barbie issue remind me of another toy that GMA talked about earlier this year. It was a doll first released in Spain that allowed little girls to pretend they are nursing the baby. Again, this sparked an outcry from parenting groups stating that the doll was inappropriate and pushed children to grow up to quickly. Because of my nutrition background, I am a HUGE advocate of breast feeding. I will definitely educate my children early on about proper nutrition, and I will use the accurate terms for body parts...no "private parts, pee-pees, or vajayjays" for my kids. This said, what is right for me might not be right for others, but I am not going to stop you from teaching your children what you would like. So I would like the same respect when it comes to what products I would like to buy. If you do not like it then DON'T BUY IT! Yesterday I got to meet Matthew Perry better known as Chandler from FRIENDS. He was working with my boss on a briefing, and I was lucky enough to get a few moments with him for a picture and to get his autograph. He was really nice and VERY TAN! Signing my "Fools Rush In" DVD...I love that movie! Also on a side story, my cute and wonderful roommate Alycyn thought that Matthew Perry asked me out on a date. This was a result of some miscommunication on GChat, but made for some hilarious conversations later on in the day. I must say I am pretty flattered that she thinks that highly of me! Finally, have you ever seen this video on You Tube? I want to be best friends with this girl! HAPPY FRIDAY EVERYONE and HAPPY HALLOWEEN! **On a side note** The opinions on this post are mine and not meant to offend anyone...I am just making conversation. Ahh thanks for the shout out!! And I can't believe you met Chandler!! That is so awesome! !